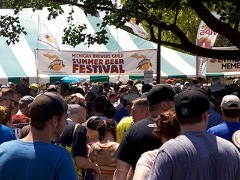 One of the two biggest summer events in the Ann Arbor/Ypsilanti area is the Michigan Brewers Guild Summer Beer Festival comes to Riverside Park in Ypsilanti on July 21-22. ​In addition to the festival, plenty of pre- and post-Festival events are planned at area establishments to keep the party going throughout Depot Town and beyond. Sidetrack Bar and Grill is hosting a Beer Fest Kickoff Party Thursday, July 20, beginning at 5pm, where they promise to bust out some “super secret beers” from their cellar. Also on Thursday night, the Arbor Brewing Company Microbrewery plans a sour beer event that includes discounts for Michigan Brewers Guild Enthusiast members and free tours conducted by head brewer Jon Wagner. And on Friday, July 21, following the first session of the Festival, Cultivate is throwing a party featuring beers from up-and-coming breweries like Ellison, Drafting Table, Batch, Speciation, River’s Edge, and Witch’s Hat. Plan to stay at one of the area's Bed & Breakfasts. Parish House Inn and Queen's Residence are located on Huron Street, within walking distance of the festival. Davies House Inn, on the first fairway of Georgetown Golf Course, is just 5 miles from the festival and on the shuttle route to the area's other summer spectacular, the Ann Arbor Art Fairs being held the same weekend, July 20 - 23 in downtown Ann Arbor. Make plans now to COME, STAY AND PLAY!